TS SET 2019 Certificates Verification Dates, List of Certificates: Osmania University issued the State Eligibility Test(SET) 2019 Notification for Telangana for recruitment as Assistant Professors / Lecturers in various University / Degree Colleges / Institutions of Higher Education and OU invited applications from eligible candidates to appear for The State Eligibility Test 2019. The TS SET 2019 was conducted by the Osmania University in 27 subjects as per its the examination schedule. 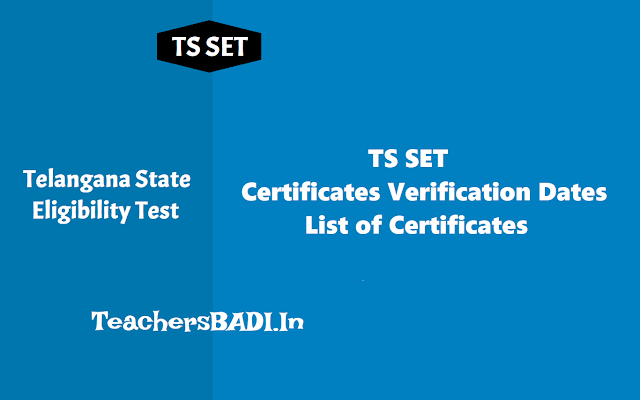 After completion of Evaluation process, the SET officials have released the results of TS SET and TS SET appeared candidates were checked their results from the official website. Office of the State Eligibility Test for Telangana 2019, Osmania University has announced the certificate verification dates for TS SET. The candidates who have qualified in State Eligibility Test for Telangana State (TS SET) -2019 are hereby informed to attend the certificate verification of P.G. Degree Certificate, Memo of marks, Caste certificate and PH/VH certificate (wherever applicable) during 24-30th September, 2019 at the follwing given Center. The candidates who have qualified, they should attend at following Center. Venue: Online PGRRCDE, Osmania University, Hyderabad.